“Almost all of the population” is destitute in the Gaza Strip. Wars and economic blockades have all but destroyed its entire economy, a UN conference has warned. If the trend continues, the territory may become “unlivable” in five years. The report by the United Nations Conference on Trade and Development (UNCTAD) says that the Israeli war in the Gaza Strip last year drove the country deep into recession and this time recovery may fail to come. The report states that Gaza’s GDP dropped 15 percent in 2014, 72 percent of households suffered from very low food security and unemployment stood at a record high of 44 percent. “The prospects for 2015 are bleak, due to volatile political conditions, reduced aid flows, the slow pace of reconstruction in Gaza and lingering effects of Israel’s withholding of Palestinian clearance revenue during the first four months of 2015,” the report says. The report stressed the impact of IDF operations in the Gaza Strip, noting three major conflicts in six years, in addition to eight years of economic blockade. The UN says that 500,000 people have been displaced in Gaza as a result of last year's IDF operation alone. More than 20,000 Palestinian homes were destroyed, and 148 schools and 15 hospitals and 45 primary health-care centers were severely damaged. The UN points to slow reconstruction efforts hindering the recovery of the local economy, while socioeconomic conditions are at their lowest point since 1967. The report also notes that the number of Israeli settlers has quadrupled since the Oslo Accords. Aid donors are being diverted from Palestine as Israel continues to impose a blockade, at the same time as carrying out special military operations against supposed militants. “No amount of aid would have been sufficient to put any economy on a path of sustainable development under conditions of frequent military strikes and destruction of infrastructure, isolation from global markets, fragmentation of domestic markets and confiscation and denial of access to national natural resources,” the reports says. At least 247 factories and 300 commercial centers were fully or partially destroyed by Israel, while the agricultural sector alone suffered $550 million in losses, according to the report. “The social, health and security-related ramifications of the high population density and overcrowding are among the factors that may render Gaza unlivable by 2020,” the report concludes. Israel has been maintaining a blockade of the Gaza Strip since 2007, on the grounds that it helps prevent arms from being delivered to the Hamas militant movement. However, critics, including human rights groups, argue that Israel is deliberately hurting the Palestinian population by not allowing humanitarian aid into the Gaza Strip and preventing any kind of sea trade. 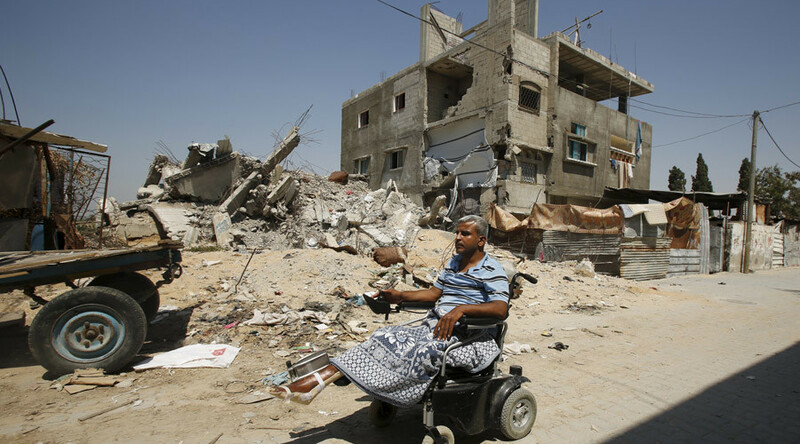 Last July, in retaliation to Hamas rockets, Israel launched a military offensive in the Gaza Strip, dubbed “Operation Protective Edge.” It claimed the lives of some 2,251 Palestinians, mostly civilians, and 72 Israelis, according to the UN. The 50-day war destroyed or severely damaged some 20,000 homes. Rebuilding has been stalled by border restrictions and political tensions. According to a July report by Save the Children, over 550 children were killed during Israel’s offensive, 3,436 were injured and an estimated 1,500 lost their parents. Around 100,000 people in Gaza are still homeless.